Mayor Ed Lee named the last three members to the Redistricting Task Force, adding two women with strong connections in the city’s ethnic communities and the first LGBT appointee. Myong Leigh, a resident of District 9, is the Deputy Superintendent for Policy and Operations for the San Francisco Unified School District (SFUSD), overseeing most non-instructional operations that support SFUSD schools. Leigh has been a SFUSD staff member since August 2000 and has dedicated his career in public education to seeking adequate school funding and creating conditions for educators to do their best work with students and families. Prior to his work with SFUSD, Leigh was the Budget Director for the District of Columbia Public Schools for two years and was a financial advisor to state and local governments on capital facilities financing and budgeting. Leigh holds a Masters in Public Policy from Harvard University’s John F. Kennedy School of Government and a Bachelor of Science in Economics from the Wharton School of the University of Pennsylvania. Leigh also is a member of the Alice B. Toklas executive committee. Sonia Melara, a resident of District 7, is the Executive Director of Rally Family Visitation Services of Saint Francis Memorial Hospital. Melara has over 30 years of management experience in the non-profit and for-profit sectors. She is a partner of CommuniQue: Management and Communications Consultants, a firm founded in 1990 to serve the management and marketing needs of for-profit and non-profit organizations. Melara also serves on the part-time faculty of San Francisco State University’s School of Social Work. Melara has served as Executive Director of the San Francisco Department on the Status of Women where she implemented major initiatives on domestic violence funding for prevention, education and transitional services. Melara is co-founder of California’s first shelter for survivors of domestic violence, La Casa De Las Madres. She is presently the Vice President of the San Francisco Health Commission. Melara holds a Bachelor of Arts and Masters degree in Social Work from San Francisco State University. Marily Mondejar, a resident of District 6, is President of the Filipina Women’s Network, the nonprofit professional association for women of Philippine ancestry living in the United States. Mondejar is a senior business leader with 25 years of global experience as an entrepreneur, strategist and advisor to Fortune 500 organizations including Cemex, Siebel (Oracle), and Webex (Cisco). She advised executives on leadership and career derailment issues, and consulted on corporate image strategies, merger implications, scenario planning, and how to maximize performance, through work with executive teams, alliance-building, and inter-cultural communications. Mondejar serves on nonprofit boards and commissions including the Friends of the San Francisco Commission on the Status of Women, Leadership California, Sweatfree Procurement Advisory Group and the Justice and Courage Oversight Panel. Mondejar earned both a Bachelor’s and Master’s degrees in organization development and leadership from New College of California and public relations graduate coursework at Golden Gate University. She has also completed doctoral course work in organizational psychology at Alliant International University. The mayor’s office confirmed that Mayor Lee personally called the appointees to ask them to serve but had not interviewed them, leaving that to staff. The Board of Supervisors OK’d three appointees to the Redistricting Task Force including one candidate who moved into San Francisco six months ago, one candidate who may have registered just three weeks before applying, and a third candidate that the Elections Department records show did not vote in two of the last five elections. The three new appointees are Jenny Lam, Eric McDonnell and Mike Alonso. The vote was 11-0, with Supervisors Scott Wiener and David Campos speaking in favor after the names were presented by Rules Chair Jane Kim. The addition of the Board’s three appointments to the Elections Commission appointments means that six of the nine seats have been filed. Kim noted that the six appointments do not include anyone from the LGBT community, although the task force is required to represent the diversity of the city. Wiener told his colleagues that he had secured a commitment for an LGBT appointment from Mayor Ed Lee, but did not give any indication of whether the appointee would be representative of the community. He also said that he “hoped” that Mayor Lee might name two LGBT appointees. The Redistricting Task Force will determine new supervisor district lines that affect voters for the next ten years. The task force is required to review existing supervisorial districts following the 2010 census that showed that districts no longer are roughly equal in population. Eric McDonnell, leader of the local United Way and who grew up in the Western Addition, moved back to San Francisco six months ago after living in Solano County for the past seven years. Mike Alonso, according to Election Department records, was not among those registered to vote in San Francisco under the name Mike or Michael or at the 39th Avenue address he listed. He could not be reached for comment. In a folow-up, the Elections Department states that there now is a Mike Alonso registered on May 11, 2011 with no voting history but could not confirm that it is the same person named to the Redistricting Task Force. Rules Chair Jane Kim’s legislative staff said that they had asked Alonso if he is a registered voter and that he said he is. The Rules Committee also chose Jenny Lam, who did not vote in either 2009 election. The application to be appointed to the Redistricting Task Force did not ask if applicants were registered voters or for their voting history. Republican activist Chris Bowman raised the issue of voting history during his testimony at the Rules Committee, stating that he believed that some applicants being considered were not registered voters or were infrequent voters. Neither the Board nor the Rules Committee members asked any applicants during the public hearings whether they were registered voters or regularly voted. Questions were aimed instead at discerning the political viewpoints and alliances of prospective members. The Elections Commission’s selection of three appointees had different results. Two of the three appointees – David Pilpel and Mark Schreiber – had perfect voting records. Pilpel first registered in 1986 and Schreiber first registered in 1999. Both voted in every election since registered. The third Elections Commission appointee, Melissa Tidwell, first registered in June 2006, according to Elections Department records. According to the Elections Department records, she failed to vote in three of the last five elections. 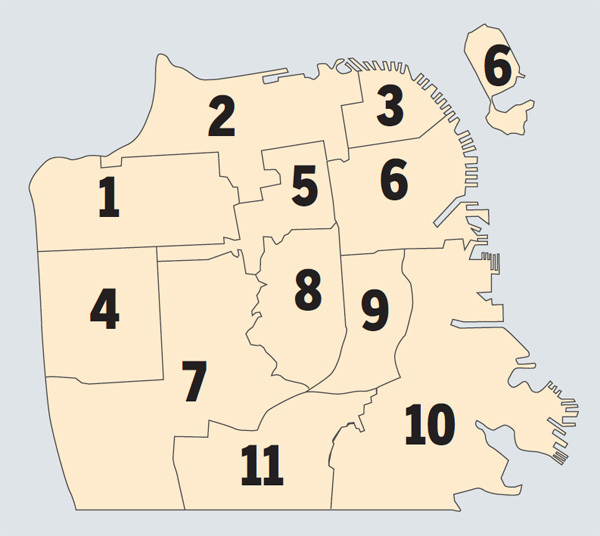 City Hall aides said that the rules do not require Redistricting Task Force members to live or vote in San Francisco, although as a matter of policy only San Francisco residents were considered.